Synopsis: It's Baltimore in the late 1840's and famed poet Edgar Allen Poe (Cusack) is in love with Emily Hamilton (Eve), the daughter of a wealthy socialite (Gleeson) who hates Poe's guts. Grisly murders that appear to be inspired by Poe's famous tales start happening and Poe is recruited by Inspector Fields (Evans) to help investigate. When the killer kidnaps Emily, it becomes a race against time for Poe to solve the mystery before he loses his love. Andrew: Hello readers! We’ve been a little quiet over the weekend because…well because we were allocating our money towards seeing The Avengers multiple times instead of seeing films we hadn’t seen yet to write reviews for. 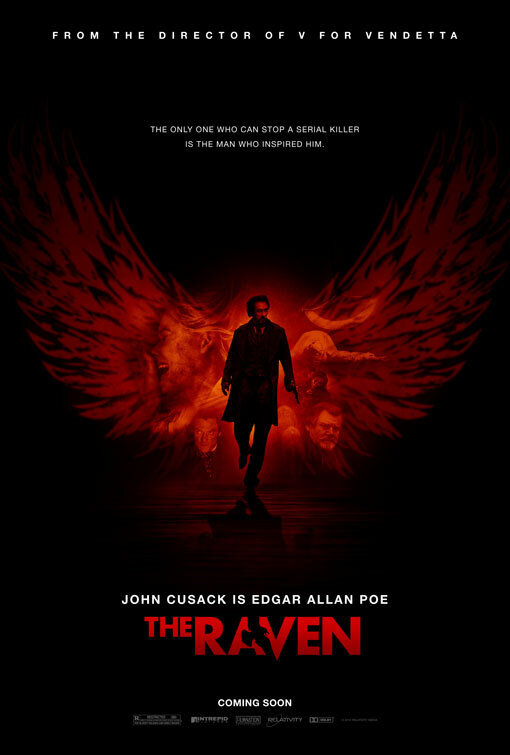 That changed tonight as Sarah took the plunge and accompanied me to a horror film – The Raven, starring John Cusack (Say Anything) as famed horror writer Edgar Allen Poe. And WOW. I mean…WOW. That…was something. A: Unless you’re frightened by the idea of paying your hard-earned money to see this movie again. Which I would be. S: …unless they rewrote the script, recast the characters and didn’t focus the story on a dead poet. Seriously, it was bad. We walked out of that movie and I just kept shaking my head and laughing. This was the first time I’ve ever contemplated walking out of a movie. A: Wait, seriously? You’ve never even contemplated walking out a movie before? A: Wow. Yeah, I think we’ve gotten the point across that The Raven isn’t a very good movie, but we should delve into WHY we’re not so hot on it. S: Here’s the thing – I went into this movie with very little expectations. I was a little concerned that it would frighten me, but then the actors opened their mouths. It is possibly the worst dialogue that I have ever heard since Star Wars: Episode III. A: That’s a very good comparison, because the dialogue here was incredibly stilted, corny and there was WAY too much screaming/yelling by Cusack’s Poe and Luke Evans’ (The Three Musketeers) Detective Fields. S: Not to mention the TERRIBLE make-up in this movie. It could just be us because we’re slight movie snobs when it comes to makeup, but right from the opening murder scene the makeup effects are terrible! Pair that together with the computer generated blood, it made me wonder if I was sitting in 300 again. A: Ok hold on, at least in 300 the computer generated blood was stylized and it looked cool, in The Raven there are two particular scenes where it is so incredibly obvious that the blood is computer animated that it just made me cringe. Not only that, but then they mix the computer blood with actual film blood in the same scene and it just looks bad. S: Oh I agree with, but whereas it had its place in 300, it didn’t even begin to fit in with this film. Here’s the thing: I like John Cusack. I think he has his place in rom-com classics. But lately he’s been wanting to do these darker, scarier films and I just wish someone would tell him that this is not his best genre. And while there were plenty of scenes where Cusack chewed the scenery like he was a death-row inmate eating his last meal, I was actually bothered more by Evans’ performance. I didn’t mind the casting of Cusack as Poe because he looked and sounded the part, but Evans’ voice didn’t mesh with a lot of the scenes he had to pull off, and jeez…there’s one scene towards the end where he delivers a line that made the entire audience (of 8) laugh out loud because it was SO BAD. S: Oh my gosh, yes. It was painfully difficult to watch. You’re right – he had poor delivery, but let’s not sell the rest of the cast short. They ALL performed equally as bad. And there were some good actors in this movie! Brendan Gleeson (Harry Potter and the Goblet of Fire) is in it! And his lines were just as bad! S: The whole plot in and of itself of a serial killer using Poe’s stories as the inspiration for his murders is a good idea, it was just poorly executed. A: Completely agreed. Like I said in our preview a couple of weeks ago, I like the premise of the movie. But you’re right, the execution was horribly flawed. S: And they make a big deal about the movie being set in Baltimore, but there is ZERO set indication that they’re actually IN Baltimore. That wouldn’t bother normal viewers but it bothered me because Poe is one of Baltimore’s claims to fame and they hardly show it except through the dialogue. And only one character actually has a Baltimore accent. A: That’s not really something that I noticed so it didn’t bother me so much, though you just reminded me about a scene where Gleeson’s character, a man who is very clearly a rich and powerful man in the city, exclaims that a certain plot point must be at his family’s church! And then they cut to everyone riding a horse to a church in the middle of nowhere in the woods! Why the hell would the richest family in Baltimore go to a church in the middle of nowhere??? Stuff like that just didn’t make any sense. - A ballroom scene where Alice Eve’s (She's Out of My League) character is having a masquerade ball held in her honor. I felt the costumes, the setting and the tension the scene carried might have been the highlight of the film. - A chase scene in a theatre hall that’s staged quite well and again, the tension was actually present, unlike most of the movie. S: I would agree with you on those two. They were the only two times I was nervous and that I had to kind of cover my eyes. We won’t give away the ending, obviously, because that’s not the kind of reviewers we are, but we will say that it was a big letdown. I was hoping that they might redeem the movie with a twist at the end, but there’s no twist. And then the credit sequence was just…it made me sit back and say “Where the hell did this come from?” It didn’t fit in with the rest of the movie whatsoever. A: Fair point. I think The Raven could have been helped if it had focused more on trying to be one of two things – either it should have stayed focused as a whodunit, or it should have gone completely with the gore and shock value. Instead it tried to straddle the line and it didn’t do either well. There’s a better movie that’s a lot like this one and it’s called From Hell. S: If you’re thinking of seeing this movie because you’re a Cusack fan or because the previews made it seem mildly interesting, don’t waste your time and money. I wouldn’t watch this movie on a rainy day where there’s nothing on but infomercials. Skip this one.